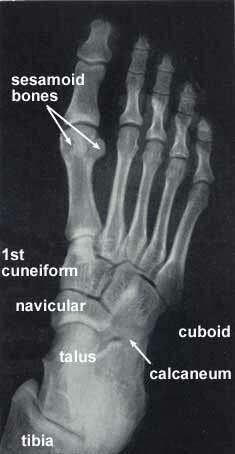 The word [sesamoid] means "similar to a sesame". First used by Galen c.180AD, he describes small ovoid bones that are "similar to a sesame seed", referencing the seed of the plant sesamum indicum, the oil of which was used as a laxative at that time. Sesamoid bones are found in the tendons of some muscles and are mostly inconstant. Largey and Bonnet proposed a classification for these bones as: accessory, capsuloligamentous, intratendineous, and mixed. Of special interest to this article are the sesamoid bones found within the two tendons of the flexor hallucis brevis muscle in the base of the foot (see accompanying X-ray image). These bones, especially the medial sesamoid bone, was attributed religious, mystical, and magical powers since ancient times. This is due to the fact that this small bone is highly resistant to natural decomposition. A Hebrew medical text dated 210 BC, attributed to Ushaia presented a small bone he called "luz" as the "depository of the soul". Many other authors, including Vesalius (who called it Albadaran), believed that upon resurrection, the whole body could reform from this "seed" bone. This belief was later reinforced by religious texts into the early Renaissance which stated that this bone was indestructible and its presence was enough to guarantee resurrection for believers.